The spy cam provides a 110º Wide-Angle View, so a large part of your room is taken care by this smart gadget. You can view live video footage of your house remotely through the app on your smartphone, iPad or PC website with 1080p high resolution anytime, anywhere, for peace of mind. Unlike many adapter cameras on the market, this upgraded camera supports WiFi network camera function. Break the distance limit between viewing and recording. The hidden spy camera sends instant notifications to your mobile phone alerting when, where, and what movement was detected, and records movement to help you keep up with everything. The USB wall charger hidden camera looks just like a regular charger adapter. The completely undetectable spy camera will have everyone thinking it's just a plain phone charger! 1. Please read the manual carefully before use. 2. Please remove the plastic film on the lens cover before use, otherwise it will cause blurred vision. [Full HD, Wide-Angle Lens]: 1080p HD resolution, 110° wide-angle lens to produce bright and crisp images. BOTOEYE spy wifi camera provides complete surveillance coverage in high-definition, capture moments with a clear picture. Digital zoom up with a simple tap on your phone. [24-Hour Monitor & Real-Time Alerts]: BOTOEYE home camera always keeps an eye on things that are important to you. The hidden camera sends instant notifications to your mobile phone alerting when, where, and what movement was detected, and records movement (optionally sends Activity Alerts) to help you keep up with everything. 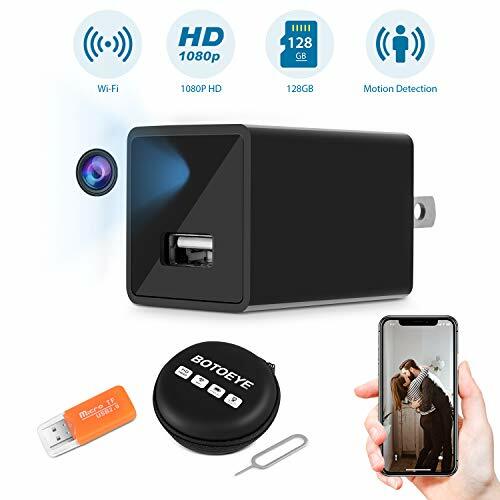 [Simple Setup]: Just plug into the power outlet near the router to ensure stable Wi-Fi connectivity and download HDMiniCam APP, with which you can remote control your hidden camera, and monitor your house in real time. [Flexible Viewing Choices]: Acess your spy camera with our mobile APP anytime and anywhere. After connected with HDMiniCam App, support to view up to 4 live camera feeds on one screen, wherever you are. Keep tracking of what's going on in every room of your house or small business. [Advanced Video Recording]: Record, store and review footage using a Micro SD card(Minimum support 8G, Maximum 128G) and manage directly from your mobile device. Alert pictures will be stored on the SD card, and you can playback the videos on your phone. When the memory full, it will auto cover the oldest video files. If you have any questions about this product by BOTOEYE, contact us by completing and submitting the form below. If you are looking for a specif part number, please include it with your message.